Trying to watch your weight? •Drinking low fat milk. It sounds like one of the healthiest beverages…But a study found that people who drank skim and 1% milk gained more weight than whole milk drinkers. Researchers say it’s because the fat in whole milk and 2% milk makes us feel fuller – longer. So we’re less likely to overeat throughout the rest of the day. •Eating with friends. Studies show that when we eat with one friend, we eat about 35% more than we eat on our own…With 3 friends, our calorie consumption triples. Dr. Brian Wansink is a nutritional science expert. And he says that we overeat with friends because we tend to stay at the table longer, because we’re enjoying ourselves, so we continue to pick at our food. We also mimic our friends’ ordering habits. So, if they order dessert, we’ll order dessert. 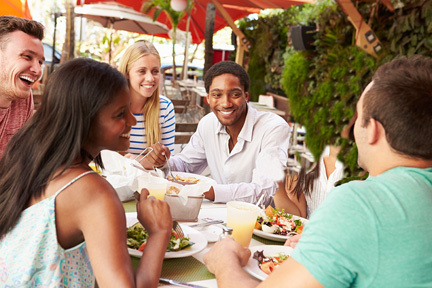 How can we hang out with our friends WITHOUT overeating? Be the first to order. Studies show that we tend to copy the first person who orders, whether they get a salad, or a burger.